A mini AC Transit bus with golf-cart-esque seating and (we presume) golf-cart-esque wiring was sitting out on Lower Sproul yesterday (just asking to be driven around campus, if only our hot-wiring skills were up to the task). The bus was a ploy by the ASUC to catch the attention of passersby and direct them to the AC Transit Forum in the senate chambers, which took place from noon to 1:30 to discuss what implications the AC Transit cuts may have on upcoming Class Pass negotiations. The speakers were mostly AC Transit employees, including planners and marketing representatives, as well as UC Berkeley Parking & Transportation Director Seamus Wilmot. 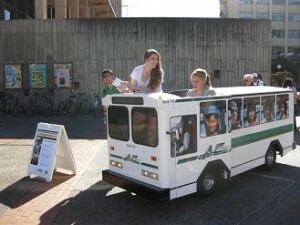 Assuming Class Pass benefits are reduced in the near future, we propose that a mini fleet of mini AC Transit golf-cart-buses be made available for students’ transportation needs. Through rigorous scientific conjecture, we have deduced that the saved gas expense from running these highly fuel efficient vehicles will help them pay for themselves within a year’s time. There, problem solved. Newsflash: Students sell their Class Passes to former students! OK, so you probably already knew that, but did you know that UCPD trolls craigslist looking to bust the sales? For reals. Of course, those Class Passes are so alluring. Current students pay for the passes through mandatory fees. If former students want the same hookup, they’d have to shell out $560 for spring-summer AC Transit bus use, according to the Daily Cal. Damn. Students also copy their passes and share them with friends, and their replicas are so good that the bus drivers can’t tell the difference. So what’s the moral of the story here? When in doubt, go to Copy Central–not craigslist. But you didn’t hear that from us.